In the last month or so, I’ve received a half dozen Facebook Travel Contests offering all kinds of wonderful trips to the winner. One came from Queensland, Australia, a solid contest that was rendered irrelevant by the horrific floods there. Princess is using Facebook the way all clever travel marketers use the social media giant: They’re asking travelers to submit their stories either as text, images or video. No question, these are great prizes. The winner gets a 10-18 day cruise of their chosen destination-Europe, Asia, Tahiti, Australia, New Zealand, Alaska..you get the idea. And most importantly, not just the cruise is free, the airfare is too. For two. The idea stems from Princess’ Cruises popular, 50 Essential Experiences where the company’s well-traveled employees share their favorite or most impressive travel events. However compelling the destinations are, Princess is asking me to give up a lot. A hopeful contestant goes to Princess’ Facebook page and has or her video or text ready to submit. They own me, in other words, and whatever I submit. I called Princess and asked if I would be barred from the contest if I did not allow them access to my personal information and give them the permissions they want? It does way more than that. 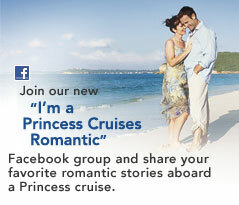 Would you give up all that information and privacy for a chance to win a cruise?